For many years, wireless headsets were mainly reserved for wealthier gamers with thicker wallets and bank accounts as they were prohibitively expensive and were a hard-to-justify purchase for many. But in recent years, companies like Corsair have begun releasing more affordable wireless gaming headsets that do away with all the bells and whistles like RGB lighting or customizable buttons to attain a sub-$100 price tag and make wireless headsets more accessible. 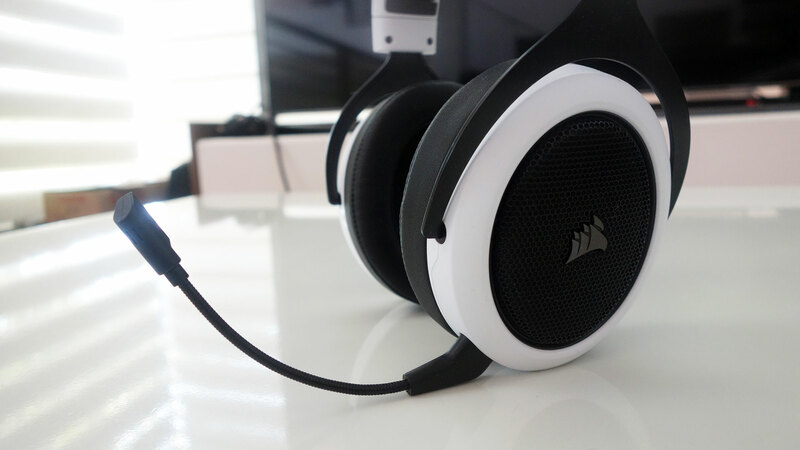 Corsair tried this last year with the well-received Void Pro and the company is back once again this year with another affordable wireless gaming headset, the Corsair HS70. The HS70 is the wireless version of the company’s HS50 headset that features pretty much the same design minus the wire. 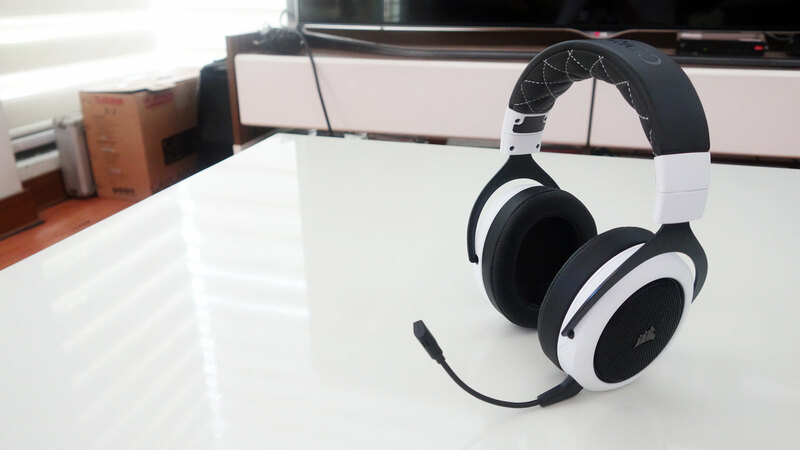 The HS70 comes in two color options – a completely black color variant and another variant that changes the color of the headset’s external plastic parts to white while the peripheral’s metal frame, leatherette, and metal grills are kept black. 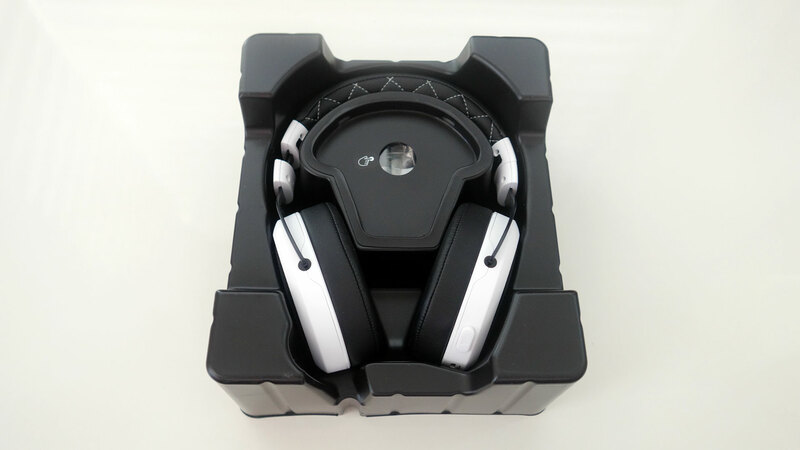 The packaging of the HS70 is pretty simple and barebones with just a box and a plastic container that houses both the headset and all its accessories. The accessories are kept in a small compartment of the plastic container, which is a nice touch to make the packaging feel a bit more premium. 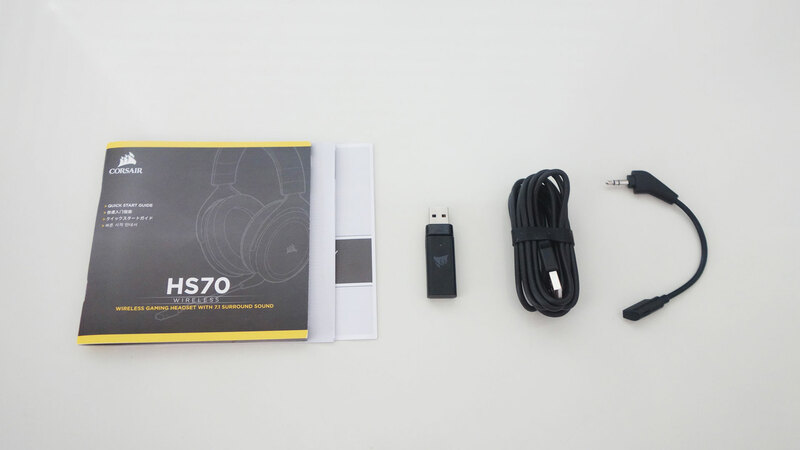 Aside from the headset itself, the HS70 only comes with a manual and warranty information, the USB wireless receiver, and a pretty long (1.8m) USB cable to charge the headset with. Just like it’s packaging, the design of the HS70 is simple and straightforward, a stark contrast from the design of the Void Pro. The aggressive shapes and angles are non-existent here and are replaced with a smoother, more conventional design. The HS70 features large, round ear cups made of thick, soft touch matte plastic accompanied with thick foam ear pads and metal grill ear cup covers with Corsair’s logo on them. The ear cups definitely feel durable and seem like they could survive a desk-height fall or two. 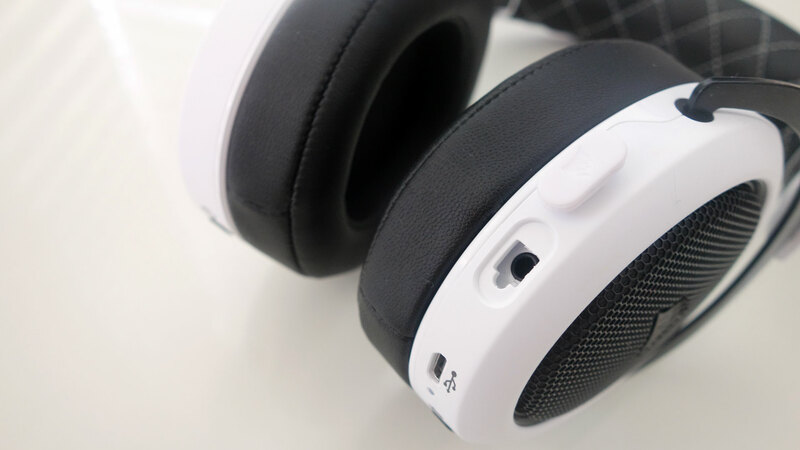 The foam ear pads of the HS70 are covered in leatherette and are almost an inch thick, which helps a lot with comfort. The headband of the HS70 also features foam padding and a leatherette cover that sits flush to the plastic covers on the ends of the headband. 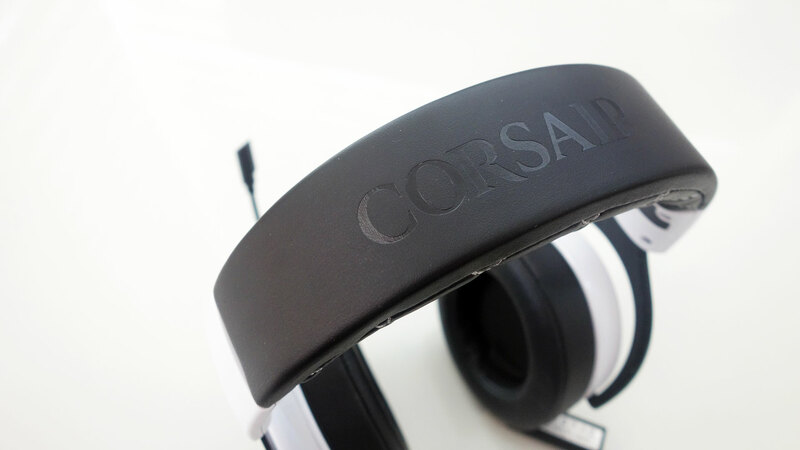 The leatherette on top of the headband is smooth and features the Corsair name engraved on it while the underside of the headband features a quilted design with white stitching. The leatherette on both the ear pads and headband give the HS70 a more premium look alongside its plastic ear cups and metal frame. The metal frame that goes along the length of the headband is pretty flexible yet still feels sturdy, which helps reduce the clamping force of the headset. In spite of its flexibility though, the metal frame still feels sturdy. The ear cups of the HS70 don’t have much horizontal swivel so you aren’t able to twist the ear cups up to 90 degrees so they can sit flat on your desk or on shoulders when you wear the headset around your neck. It’s not much of a deal breaker but it would have been nice to include that capability. The HS70 also features a detachable, flexible microphone. While being able to remove the mic doesn’t really affect the weight and comfort of the headset much, having the ability to get the microphone completely out of the way when you’re playing single-player games is a nice quality of life feature. The microphone itself is thin, discreet, and incredibly flexible, allowing you to position it optimally. As previously mentioned, the HS70 features a simple and straightforward design that doesn’t come with any bells and whistles. There’s no RGB lighting here or a large array of buttons. There are only two buttons on the HS70 itself – a power button and a microphone mute button – alongside a volume scroller, a USB port, a LED indicator, and the port for the detachable microphone. The power button sits alone on the right ear cup while everything else is placed on the left. This helps prevent users from accidentally pressing the power button instead of the microphone mute. Surprisingly, and somewhat to its benefit depending on your perspective and setup, the volume scroller only controls the volume on the headset itself and isn’t synced to Windows volume. This allows you to independently adjust the volume of the HS70, which is a pretty good feature when your setup includes multiple audio output sources like speakers and other headsets. Additionally, since the volume scroller doesn’t infinitely scroll and has actual end points, you can find an optimal volume position in the scroll (much like volume knobs on other audio equipment). In spite of its size and materials, the HS70 is a pretty comfortable headset to wear, even after long hours of use. The large ear cups make it sit more comfortable on the side of the head without pressing on your ears, although your mileage may vary. The size of the ear cups and thickness of the ear pads makes helps lessen the fatigue of wearing eyeglasses with the headset. As previously mentioned, the flexible metal frame of the headband also helps reduce the head clamp of the HS70, which helps reduce strain and fatigue. The thick padding on the headband eliminates pressure from the top of the head even though the HS70 weighs 330 grams. The leatherette covering on the ear pads also helps the HS70 feel more comfortable although they do tend to get a bit warm, a usual trait of headsets with leatherette ear pads. The warmth didn’t cause much issue though as we were easily able to use the headsets for upwards of six hours without much fatigue. The sound performance of the HS70 was quite impressive for a wireless headset at its price range. The sound signature is mostly balanced with just a slight boost to the bass that doesn’t overpower the other frequencies but helps improve the listening experience when playing games. This is especially evident when playing games such as first-person shooters where footsteps usually register in the lower frequencies. There is some barely audible sibilance in the high-end frequencies when the default EQ is used but it isn’t at all bothersome so keeping the default is perfectly fine. The sound stage and instrument separation of the HS70 are also quite impressive, even when using the headphones in stereo mode. Activating the 7.1 surround sound feature takes the sound stage and instrument separation a step further with a noticeably wider sound stage and an improved instrument separation that has a much clearer distinction of not just direction but also distance. The detachable microphone of the HS70 was quite surprising, as we usually except gaming headset microphones to be lackluster. The mic on the HS70 features impressively clear sound that is more than good enough for voice chat. The output of the microphone was also sufficiently loud while at the same time doing a pretty good job of suppressing environmental noise even while speaking. While we don’t recommend it for professional voice recording, it’ll definitely meet the needs of gamers who use VOIP clients or in-game voice chat. The range on the USB wireless receiver is pretty impressive. Whether you’re sitting right in front of your laptop or desktop computer or you’re sitting on a couch a few meters away from your PS4, the receiver was able to handle the distance really well with no obvious effect on reception or sound quality. We were even able to move as far away as 30 feet and still get a good reception despite the signal having to go through a couple of walls. One of the common concerns for wireless peripherals is the device’s battery life. With the HS70, we were easily able to get around 16 hours of usage before it began to warn us about the battery getting low, which is more than enough for a day’s worth of gaming for many people. Those who want to use it a bit longer beyond its battery life can actually use it while it’s plugged in via its included USB cable. The HS70 does take a few hours to charge to full depending on where you plug it in, although Corsair has told us that it would be safer to charge it via your computer or PS4’s USB ports rather than using a USB charging adapter. The Corsair HS70 works with the company’s CUE software, which is the company’s central software for all their compatible gaming peripherals. The software allows users to activate the HS70’s 7.1 surround sound feature, tweak EQ settings and profiles, adjust the microphone volume and sidetone (which transmits the input of your mic to your headphones so you can monitor your own voice). You can also monitor the HS70’s battery life via the software. The CUE software is fairly easy to use and notably has a dashboard feature that allows users to keep certain features of their compatible Corsair features easily accessible for quick adjustments, such as the EQ settings of the HS70. One caveat of the HS70 that relates to the CUE software is the usage of the 7.1 surround sound feature on other devices such as the PS4. Because the 7.1 surround sound feature requires the CUE software to activate, you’ll be stuck with stereo mode when you use the headset on a PS4. The same goes with EQ settings as well. The Corsair HS70 is an undeniably impressive headset that provides quality wireless audio at a relatively accessible price tag. In spite of its cheaper price tag, the HS70 is still a well-built peripheral that is both sturdy and comfortable. Its features, such as the removable microphone and the minimal physical controls, have all been purposely designed and its battery life beats even some of its more expensive counterparts. Its sound quality is also quite impressive for a wireless headset in its price range. We definitely recommend the HS70 for gamers who are looking to switch from a wired gaming headset to a wireless one at a more accessible cost.